2009 is close and so is the arrival of a host of new gear. Team Fish has been busy and your feedback has made a difference. Look forward to a series of posts to come in 2009 on all the new and revised gear plus some unique technologies to make your fishing experience better. The S9 Patagonia Fishing line contains 15 New and 6 Revised products not to mention the rest of the product categories. Check out this upcoming ad for the New Guidewater Waders that should be in stores late next month. Cool advertisement. 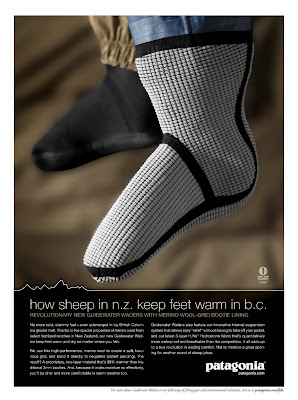 If it runs anything like the wetsuit advertisement there will be some people who don't understand that the wool grid is on the inside of the bootie, not the outside. The outside is black neoprene. All of the wetsuit ads going forward will make mention of this. Interesting point IT Guy. We'll see if there is confusion once this ad starts showing up in the mags. Note that you can see the other bootie in the background (black neoprene) and it does state in the ad that the wool grid is a bootie lining. Maybe this will help clarify things....or maybe not. Shows up in the mags? How about when it shows up on the Web? In all seriousness, I just spent a few hours with a surfer who was going to buy a pair just because he had been surfing in the same construct in Lake Michigan for the past year. I'm not sure I'm understanding your comment Marshall. Are you saying that a surfer wanted to buy a pair of Guidewater Waders to surf the waves of Lake Michigan? Well, no. He was so impressed by the merino wool wet suit liner that he figured the wader booties were just the ticket. I see. Definitely point surfers to the Surf line for wetsuits and accessories. The cold weather gear is hitting the warehouse at the end of January. Question for Patagonia wader fans... I'm going to buy a pair of watermaster 2's... maybe even guidewaters if I can find money under my couch. Here's the question - I'm 5'11", 175lbs, size 10 boot. Can anyone confirm what size waders I should get? Many thanks - and may the big fish favour your flies! Well I am 5' 9" and 175 pounds, and have been wearing Mediums. However I find myself fishing in a lot of extreme conditions (freaking cold), so I am adding layers often. I am going to try some Medium King's, so I can bulk up for the majority of my fishing. I am sure I just confused you, but I at least wanted to mention it, as the conditions we fish in are an important part of the decision process. And look hard under the couch, as the wool/neo booties are AMAZING for keeping your feet both dry and warm. Even in hot weather I am finding them much more comfortable then the standard bootie. I'm 6', 180, and the mediums were just too short on me, a large fits just about perfect. Thanks for the question JockScott and for the advice TP and Matt. Wader fit is a very personal thing and end use (layering system) is a big factor in the equation. I'm 6'0" and weigh 190lbs. My inseam is 31" and my shoe size is 10.5. I love the Medium Regular for most of my wading. I like the close fit because it wades well and there is no excess fabric to fold, crease and potentially fail. Others may feel as though this fit is too snug. For my steelhead forays, I like the Large Regular wader with the Medium bootie (LM Reg). This allows me to puff up with insulation and still have range of motion. One critical component of the new wader lineup is the revised gravel guard design which has bearing on proper fit. The new gravel guard is much shorter than on the Watermaster II. The guard hook should be connected to the second lace crossing (some can reach the third cross)on your boot. This allows the guard to cover the boot top and speed hooks with a reliable seal. If you attempt to hook the gravel guard too low down on the boot you will experience some tightness and this will impede maximum leg lift range. The bottom line is that you should do yourself a favor and try on several wader sizes before purchasing a pair. Sometimes you'll even see slight variation between waders of the same size. Keep the questions coming. I'm here to help. As always El Pescador says it best. When we looked at these styles for fit, many factors went into place, leg lengths, foot lengths, body width, etc. All the styles allow at least a minimum of layering. If you need bulk layering because of cold you will need to keep that in mind, best is to try them on with the layering you plan to use, do some deep knee bends to be sure the leg length is long enough for you. short-29 1/2" inseam with booties size S-L depending on size of garment. regular-31" to 35 1/2" inseam with booties size S-L depending on size of garment. long-36 1/2" to 38 1/2" inseam with booties size L-XL depending on size of garment. king-32" to 36 1/2" inseam with booties size S-XL depending on size of garment. Keep in mind fit does vary some from style to style. Thanks for sharing some of the measurement data Merri. I'm sure the community appreciates it when Development or Quality personnel join the conversation. I know I do. The majority of my fishing is in freakin' cold water too... typically with a few layers under. I wear medium kings in a competitor brand, but I have too much room in them. this helps though - sounds like large is the way to go. The Large may be the way to go JockScott but I'd still recommend that you try on a few sizes. Also, note that the Large Regular waders come with two different bootie sizes (LM 9-11 and L 11-13). I'd love to... but have nowhere near by that carries the Patagonia fishing line. I've been traveling to the US quite a bit lately, so hopefully I'll find a chance to stop by one of your retailers. I have a few months to go before waders are badly needed. Our season opens in April... but it's not the type of fishing that needs brand new gear. In fact, it's the type of fishing that makes you need brand new gear. Will we still be able to guidewater waders in to the Reno service center to have the stocking feet swapped out for larger sizes? Also, any idea how much the cost will be for this service? Like JockScott, I don't have the luxury of a local Patagonia dealer, so I doubt I'll be able to try the waders before I buy them. I'm 6'0", 160-165 pounds and if I measured it correctly, my inseam is approximately 32". Judging by El Pescador's post (and others), medium regular will probably be the best alternative for me. Looking at the size charts, the S09 waders are listed with an inch shorter inseam than the 2008 Watermaster II, depending on size. Does this reflect an actual change in the fit, or just a revision of the recommended body size, and if so, would I be better off with the slightly longer 2008 model? Sverre, Just my opinion here, but I would go with the Large's. I'd rather have a little too much room, then not enough room. And on those days when the storms move in, you can easily add a few layers. Nothing worse then feeling restricted when your traipsing all over the river. I suspect El Pescador will jump in when he gets time. Thanks for all the comments and questions Way Upstreamers. Note that our service center will have the capability to customize both the regular and wool grid booties. Just remember that when it comes to Large Regular waders, we offer two stock booties sizes now to help minimize customization requirements for a portion of the demand. Regarding inseam and fit, there is a difference between 2008 and 2009 models but it is largely in volume. Our fit team worked to identify excess fabric areas and then shaved this excess off. The 2009 models are a touch trimmer than 2008 but the inseam differences are minimal. One last comment here, keep in mind that neoprene booties will expand slightly when wet and some relaxation will occur over time so don't be too concerned with a close fitting bootie during try on time. I'm not suggesting that a constricting fit is good. I've just seen too many folks opt for a bigger wader with a bootie that's too big just because of a belief that a form fit means cold feet. Thanks to the Gulf Stream/North Atlantic Drift, we're spared from the most extreme temperatures here in the western parts of Norway, so I'm really not looking for waders to accommodate for bulky layering. If it ever should become necessary with such extreme layering though, I have my current pair of waders in reserve for that. In other words, medium seems to be the most likely choice if I end up buying the waders without trying them first, even though I run the risk that the regular version might be just a bit on the short side. Is the fit of the guidewaters the same as last year's Watermaster II? I can't find a dealer that has Guidewaters to try on, but I can try on WMII's. Also, is the fit the same between the watermaster and guidewaters? 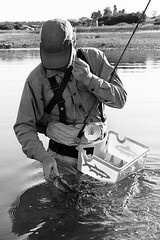 The 2009 fit of the waders is slightly trimmer in the lower leg compared to the previous Watermaster II and Light models. Every other measurement stays the same. The fit is the same between 2009 styles (Watermaster and Guidewater). Our regular 3mm bootie grading did not change but the wool grid bootie required just a tad more volume so that it would fit the same. Let me know if I can help you dial in your fit further Anon.